If there was massive fervour around the iPhone X when it launched last year, it's been surpassed in 2018 according to online phone retailer Mobiles.co.uk. It says that interest in iPhone XS deals has been bigger during the week long pre-order period than its predecessor. A spokesperson from Mobiles.co.uk told us that: "Apple certainly delivered another show stopping handset for its 11th anniversary. "I believe the innovation in this handset has undoubtedly led to an increase in interest in comparison to the iPhone X, with stunning smart photography and bokeh technology to create those stunning in-depth images." The iPhone XS goes on sale proper this Friday, September 21 and pre-order deals are available to purchase now to ensure that you're among the first to receive the XS. We've highlighted three of our favourite deals below, or use our price comparison at the bottom of this page to compare the best iPhone XS deals in the UK. 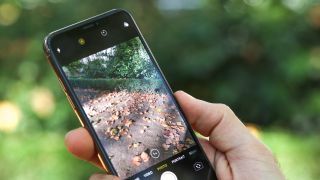 This was the best iPhone XS deal we saw on Friday, and a few days later it still reigns supreme. Pay a bit of a wedge upfront to secure sub-£60 monthly bills for an extraordinary 100GB of data per month. And because this is on O2, you'll be privy to its Priority rewards for free coffees and early-bird concert offers, too. With so many facets to this XS deal, it's hard to know where to start. How about the ginormous data allowance. Or the free handset upfront. Or the automatic cashback bonus. And then there's the fact you'll be on the UK's fastest 4G network. There's a lot to love about this tariff. If you're going for one of the world's most expensive mobile phones, you're probably the kind of smartphone user who won't compromise on data either. So how about going unlimited? Three is your go-to network and this is its cheapest iPhone XS deal with all-you-can-eat data, texts and calls. Our exclusive promotion from Carphone Warehouse may just help you make your mind up when deciding which XS deal to go for. Pre-order now (or sign up anytime by October 7) from Carphone, and you'll get a £40 gift card from Currys/PC World in a few weeks.